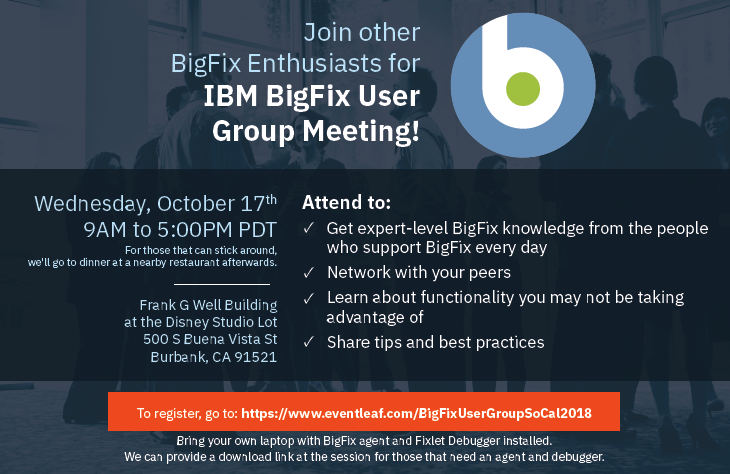 On October 17th BigFix User’s in Southern California will meet to network and share approaches/ideas on how they are utilizing BigFix in their companies. Speakers from many different industries will provide there insights to process and procedures related to BigFix. IBM will share new developments associated with BigFix. Please join us if you’re in the Los Angeles, California area! We’d love to see you! Plus, due to high interest, we got a bigger room to accommodate more people!! Thanks to everyone who came! Hopefully we’ll get more customer presentations in future meetings. It’s always fascinating to learn about others’ challenged and how they overcome them.